This is a huge, spicy, sweet, 500 horsepower smoke from Tatuaje. It was the first Cojonu blend released. Cojonu being colloquial Spanish for "ballsy"... for the first half or so, I would have hardly considered this a ballsy stick. Tasty, sure, but not even very spicy, much less powerful. Things really ramp up in strength just around the halfway point. For you full body lovers, this is a badass smoke, that you will definitely appreciate. Price tag is a little high, but smoke time is long. You really get something good with this one. Highly recommended. Full review with a ton of photos at the blog. Great review. I've noticed I've had to change my smoking patterns with the few sticks I've smoked due to the way they've burned as well, another great thing about this hobby, everday is different. One quick question, what does "toothy" mean in regards to ash and wrappers? ive also seen it in reference to larger bumps, not just those little ones. 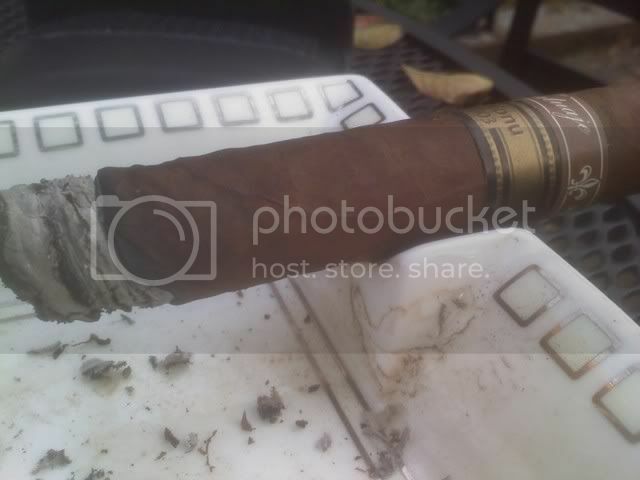 think a wrapper that is more "rugged"
in general the pic Doc here posted is what i always thought of as "tooth"
i am not a huge fan of Tatuaje cigars. dont get me wrong, they are not bad. i do feel that they get more hype than they deserve and they have a slightly over priced sticker on em. as far as being a longer smoke, i always seem that i am upset at how fast these things burn. iduno.... maybe the couple dozen that i have had in the past two years have all been "bad sticks" but if thats the case then i wouldnt buy the brand. iduno... its just another case of personal taste i guess. so those bumps are mold??? ... no? What makes you think that? Oh, okay I see actually. Yeah not hairy. Hairy is what mold looks like on cigars, in patches usually. Tooth just looks like little hair follicles sometimes.